Details regarding the late Republican “Maverick” Sen. John McCain’s (R-Arizona) role involving President Donald Trump were revealed in recently unsealed court filings, according to USA Today and Judicial Watch. The revealed documents unleashed a new round of Trump fury against McCain seven months after the senator’s death. Although the FBI once held of position of being the world’s best and brightest law enforcement agency, it is now distrusted by far too many Americans thanks to agents’ anti-Trump/anti-Republican agenda. John McCain dispatched his staffer to the United Kingdom in order to obtain what’s known as the ‘Trump dossier’ from a retired MI6 spy, Christopher Steele after a former British diplomat told him about blackmail tapes. While the American news media bombarded the nation with anti-Trump/anti-GOP stories, they were careful, as usual, in how they covered their Republican hero they built up as the U.S. Senate’s maverick. “If you look up the political term RINO in a dictionary it should carry a picture of McCain with the definition ‘Republican In Name Only,’” said police adviser for the National Law Enforcement Legal Defense Society, Charles Coultner. 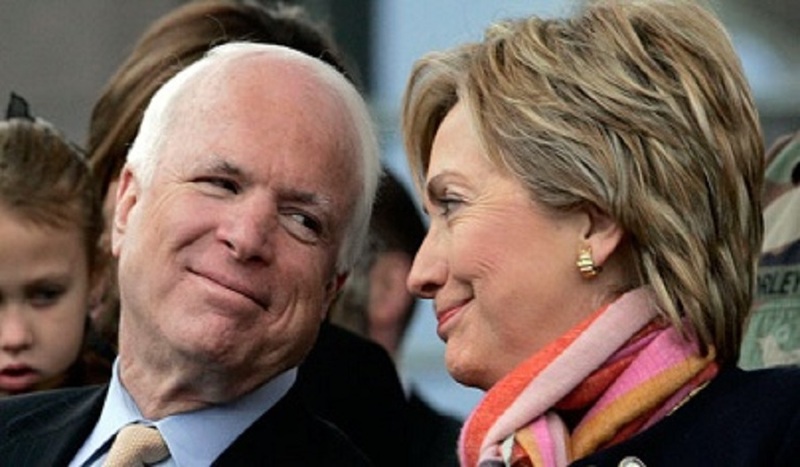 Shortly after the election — that left Donald Trump the winner and Hillary Clinton the loser –John McCain attended a Canadian conference and spoke with a ‘former senior western diplomat’ who knew of the dossier’s existence, claims the United Kingdom newspaper The Daily Mail. Sir Andrew Wood described to reporters his dealings with McCain: “I would like to stress that I did not pass on any dossier to Senator McCain or anyone else and I did not see a dossier at the time.” However, its what Wood did not say that was interesting: He didn’t deny telling McCain about the dirty dossier. The Wall Street Journal exposed the ex-spy who actually obtained the documents as being British subject, Christopher Steele.